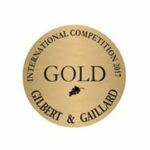 Bijou de Sophie Valrose Cabrières Rosé wins Gold at Gilbert & Gallard. Orangey pink. Alluring nose recalling strawberry, redcurrant and raspberry backed by spice. The palate is deliciously concentrated and aromatic with crisp red fruit accents and freshness. Persistent finish suffused with spice.